Here’s a good looking infographic that shows the tech giants revenues and profits. Enjoy! Upgrade your iDevice to iOS6 GM NOW! As you already know, Apple released last night the iPhone 5 and made us aware that iOS 6 will be available to the public on September 19th. However, if you have a developer account, iOS6 GM (the final version of the OS) can be downloaded and installed right away. Google for iOS 6 GM (you’ll easily find the version for your iDevice) and download it. Back up your iDevice with iTunes. Launch iTunes (make sure it’s the latest version), click on your device then on the page that has just shown up, hold SHIFT on your keyboard if you’re on a PC or the option key on OSX and click on Check For Updates button, then point to the place where you have your iOS 6GM file and let it do it’s routine. Apple start sending out invitations to a couple of thousands lucky persons in the world to take part at their event taking place on September 12,2012 at Yerba Buena Center in San Francisco. 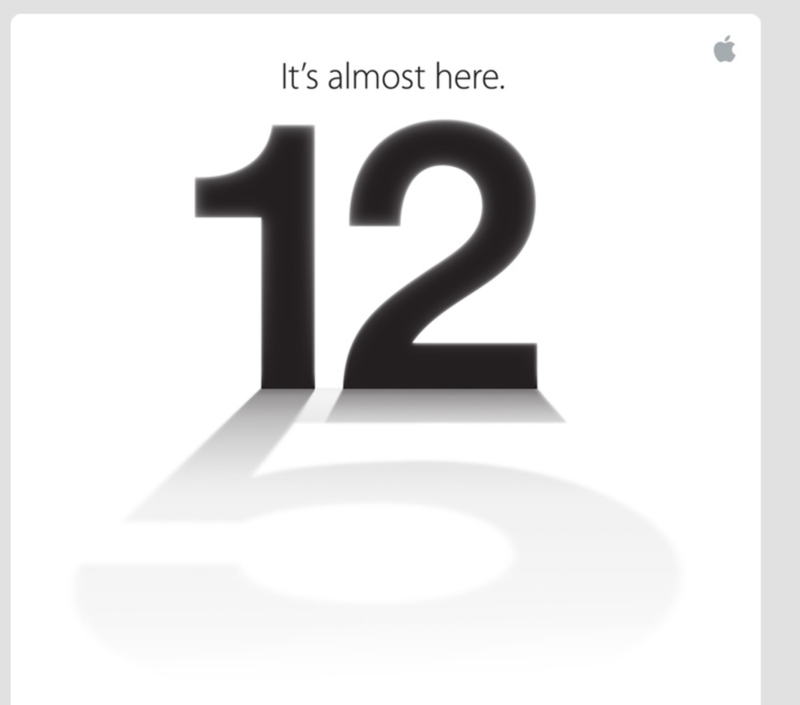 In the image above you can see in the shadow of number 1 and 2 the beginning of the number 5 which leads me to believe that we’ll see the iPhone 5 at the event. Can’t wait to see what is Apple going to come up with! Stay tuned for more! The New iPhone/iPhone 5. Complete rumor infographic. The cool guys at Nowhereelse.fr have put together this awesome infographic that sums up the rumors for the next-gen iPhone. Check it out below! This year, Netflix viewers watched roughly 1 billion hours of videos in a just one month. This act alone speaks volumes of the tremendous amount of content viewers are soaking in every month and the ever-growing popularity of Internet videos and online streaming in today’s society. The internet has transformed the way we watch and receive our daily dose of news, entertainment and education. Even bigger, it’s transformed how we view the television. Slowly but surely, the TV is having to face the reality of a losing battle against online streaming and viewing. A large part of that is owed to the instantaneous nature and the flexibility of online videos that TV simply can’t compete with. While only time will tell the fate of television as we know it today, we can’t help but wonder, is the death of television coming soon? This infographic by Allison Morris at AccreditedOnlineColleges.com takes a closer look at this phenomenon and the growing trend and popularity of online videos. Check it out below! In case you were wondering how applying for a job evolved, here’s a pretty neat infographic that should answer your questions. Enjoy it! As some of you might know, NetherRealm Studios (the creators of the latest Mortal Kombat game instalment) are preparing to release in 2013 a new fighting game based on the DC Comics super heroes and villains, called Injustice: Gods Among Us. Thanks to the guys at IGN we’ve got our eyes on 15 minutes gameplay footage and interview with Ed Boon, the creator of the game. Go check it out below and let me know what you think of it. Enjoy! Thanks for visiting and don't forget to check back regularly for the latest, truly important updates!